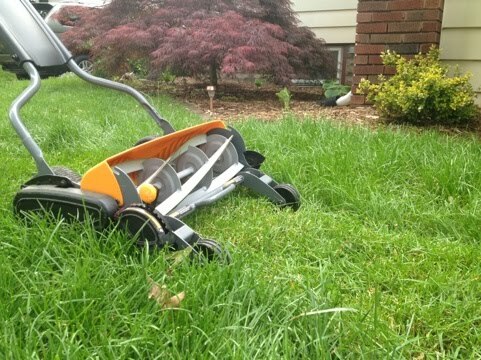 DIYSpirit.com: Fiskars Momentum Push Reel Lawn Mower - Review - It's not the 50's it'sthe future! I have been using a reel mower for 6 years now and I have just upgraded to the Fiskars Momentum push reel law mower and I have never been happier mowing the lawn and I've been even happier since my wife likes to use it. The main reason for the upgrade was the benefits of the height adjustments. My old reel mower had a set hight of an 1 1/2". I have fought weeds in the past 6 years but in the few months that I've had the mower I can already tell that leaving the grass longer (I use 3 1/2" but it goes to 4") has cut down the weeds emensly and the lawn is greener & healthier. I had always thought that my lawn looked like crap because I don't use synthetic law fertilizer like my neighbors. It turns out I just needed a better mower. This mower is easier to push even though it's much heavier than most reel mowers. It cuts the grass in front of the wheels which is a big plus when you are up against an edge. The blades have a 7-9 year life before they are suggested to be sharpened. Which means for my small lawn I probally won't have to sharpen the blades for a good twenty years. The cut on the grass is very clean. Although it will miss a few tall straggling pieces of grass it does a great job compared to the old mower. This mover is very quiet. You could easily have a phone conversation while using it. Noise polution check! Also no gas, check air pollution. Low cost of maintenance check. Although initially this mower is more expensive than its competitors not having to sharpen the blades every year will save time and money. Even if you have a larger lot this smooth operator will easily tackle the job. When it comes to lawn mower repairing, you need to first of all locate the part that has actually been damaged. Lawn Mower Repair Its belts, blades, chains, etc. are few common elements that get broken on lawn tractors. To give our gardens the best look we really need the best reel mowers and you have written a good post on reel mowers. I myself have bought one of the Top Reel Mowers, so that I can give my garden a new look and also help readers give right ratings and reviews about reel mowers.